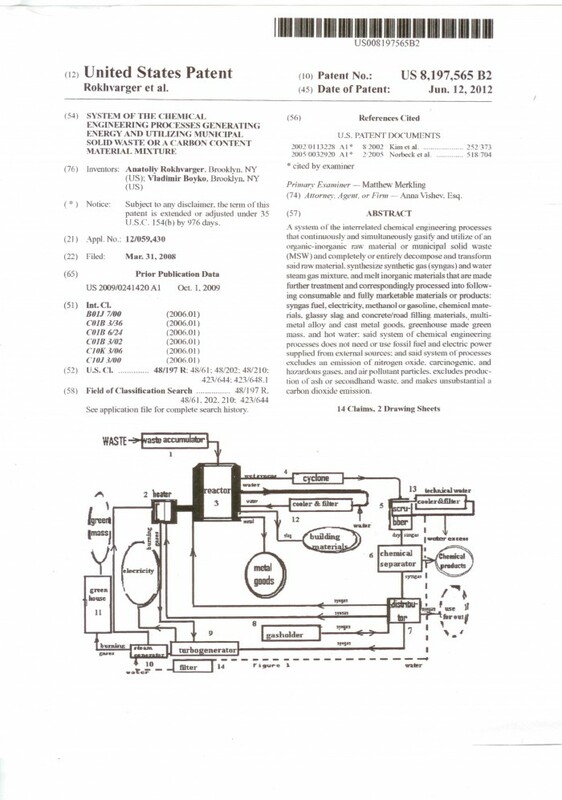 Annotation: We sell/license the US Patent # 8,197,565 defining parameters of construction and operation of the well profitable and super-clean waste-to-energy (WTE) plant. Invented WTE plant complete recycles 100000 ton/year municipal solid waste (MSW), which renewable produce 100000 town residents. Said WTE plant can supply 17MW for 3 cents/kW-h to said 100000 people, making them energy self-reliable, as well as supply hot water, simple metal goods, road and concrete gravel and some vegetables and utilizes 90% CO2 emission. Simultaneously, WTE plant does not: a) use external fuel, b) produce ash or secondhand waste, and c) emit pollutant gases,. ROI = 40%. 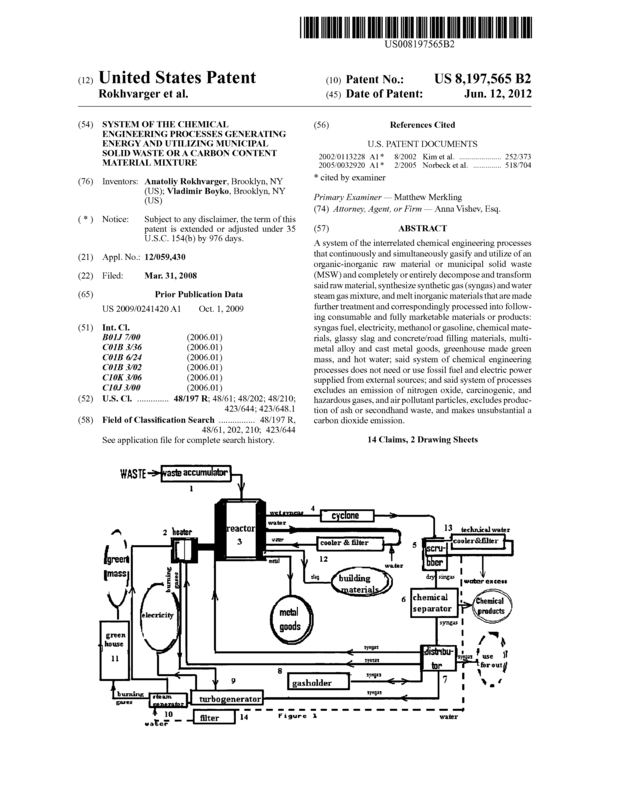 To adjust self-sustainable biomass pyrolysis process,for gasification and recycling organic/inorganic mixtures of MSW, we invented superefficient Thermo-Chemical technological Method (TCM) and created US Patent # 8,197,565, “System of the chemical engineering processes generating energy and utilizing municipal solid waste (MSW) or a carbon content mixture". 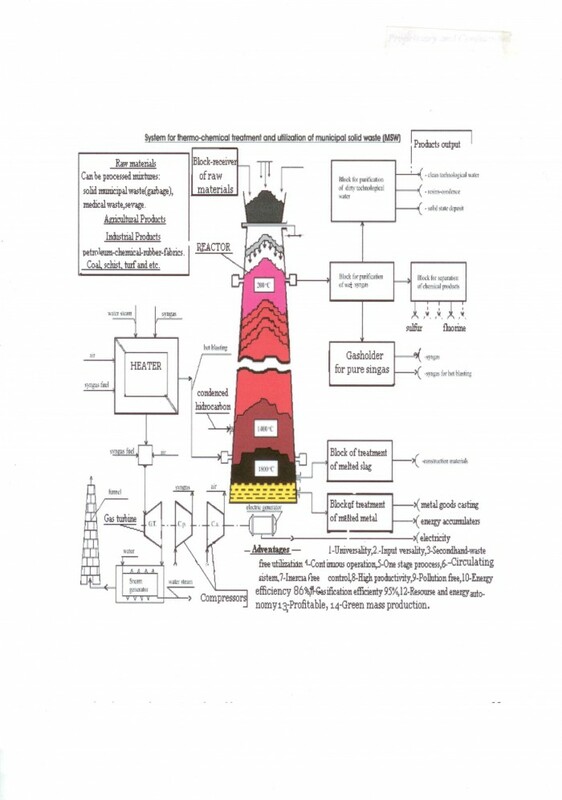 The patent defines major parameters of construction and operation of the well profitable and clean TCM-WTE plant, which altogether provides superefficient and clean gasification of organic part of MSW and complete recycling (utilization) of the inorganic part of the versatile feedstock mixture including renewable MSW. The patent defines major parameters of construction and operation of the well profitable and clean TCM-WTE plant, which altogether provides superefficient and clean gasification of organic part of MSW and complete recycling (utilization) of the inorganic part of the versatile feedstock mixture including renewable MSW. In difference with traditional pyrolysis systems, invented TCM-WTE plant gasifies MSW and other carbon content feedstock in cupola-shaped column reactor at 1550 0C – 1750 0C and 4 atm – 6 atm steam pressure. At this temperature, water molecules dissociate on oxygen and hydrogen. 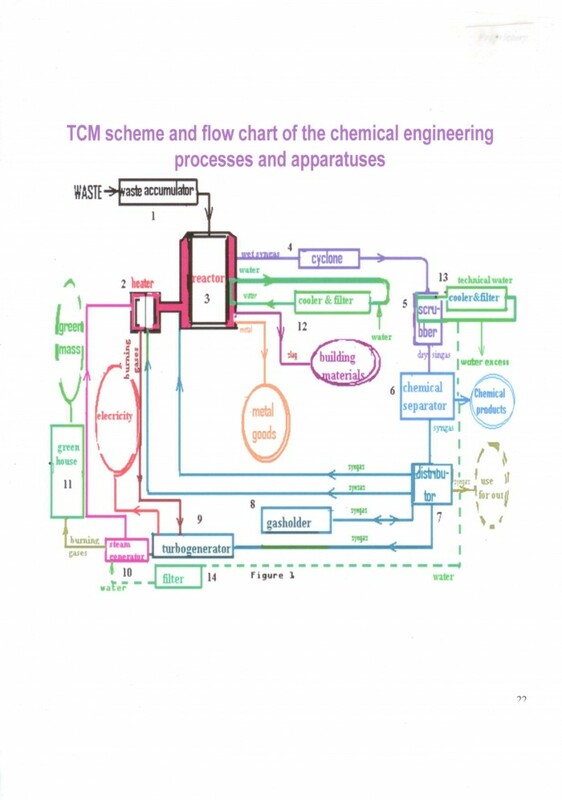 Therefore, TCM-WTE plant produces huge volume of synthetic gas (syngas), which on 50/50 in weight percents consists of carbon oxide and hydrogen gases. An excess of the produced syngas uses to overheat steam in special heater. Then overheated steam returns in the cupola reactor to provide required temperature. The major part of the produced syngas burns in electro-turbine to generate power. Simultaneously with organic gasification, at temperature >1550 0C all inorganic materials melt in to glassy slag and multi-metal alloy that form in the bottom part of the same cupola reactor two separate liquid layers. 24) makes 17250 – 26000 households or 75000 – 125000 town residents and day-time workers self-reliable (self-supplying) for household electricity, hot water, some simple metal goods, road and concrete gravel and a some amount of vegetables or flowers. 25) complete, clean and efficiently recycles urban MSW or specific wastes, as plastic, cartoon, agricultural, food production, garden and forest wastes, home demolition waste, used asphalt, used tires, ash dumps, and old landfills. 26) complete and efficient organic gasification and inorganic recycling (conversion in useful products) make unnecessary very expensive waste sorting and separation of cartoons, plastics, resins, glass and metal cans. Prototyping: 1. The prototype of the TCM system 14 months successfully operated at the Salavat Yulaev (former Shevchenko town, f. USSR, now Turkmenistan) plant, which gasified peat and asphalt. 2. At High Temperature Institute of f. USSR Academie of Science 20000 hours operated a heater providing steam temperature 2300 0K . Modeling and design: Recently, we provided together with specialists of Retech Engineering company and professors and students of University of California San Diego, Jacobs School of Engineering. There we.,approved feasibility and efficiency of the entire TCM-WTE system, as well as defined detailed parameters of construction and operation of the cupola reactor and electro-turbine. We provided reactor simulation, turbine analysis, Environment impact and economic analysis. 6)	Profit from each one ton of the utilized MSW (without customer fee for MSW collection), $US: a) 200; b) 0: c) 0. Using, for example, an average MSW composition from four landfills in Connecticut State of the US, TCM-WTE plant can complete and clean recycle 100,000 ton/year MSW, which produce 100,000 residents and daytime town visitors. Said plant can continuously supply 17 MW for 3 cents/kW-h electricity to said 100,000 people, making them energy self-reliable, as well as supply significant part of the consumed hot water, simple metal goods, road and concrete gravel and some vegetables. TCM-WTE plants would simultaneously solve three growing U.S. and worldwide problems: 1) complete and clean recycling of day-by-day renewable municipal solid waste (MSW) as well as other carbon content wastes; 2) keeping clean land and air of towns and global atmosphere; and 3) substitution of fossil fuel on renewable and cheap energy generation sources. The estimated US MSW market is $200 Billion. 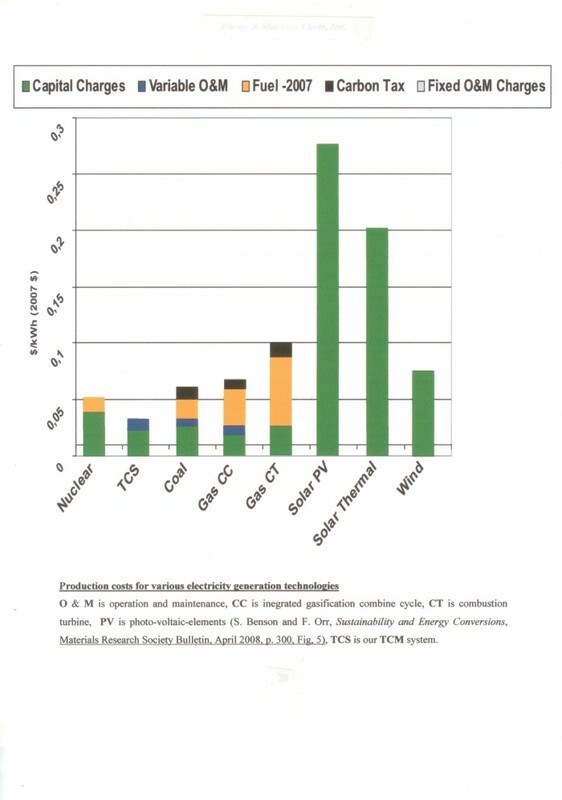 The US-wide implementation of TCM-WTE plants would: a) result in generation of 450 Billion kW-h/year electricity, b) provide 10% decrease of the GHG emission across the U.S. and c) reduce 10 – 12% consumption of the natural gas and coal. We are looking for an outright sale or a license with royalties and partnerships. Page created at 2019-04-25 14:12:20, Patent Auction Time.